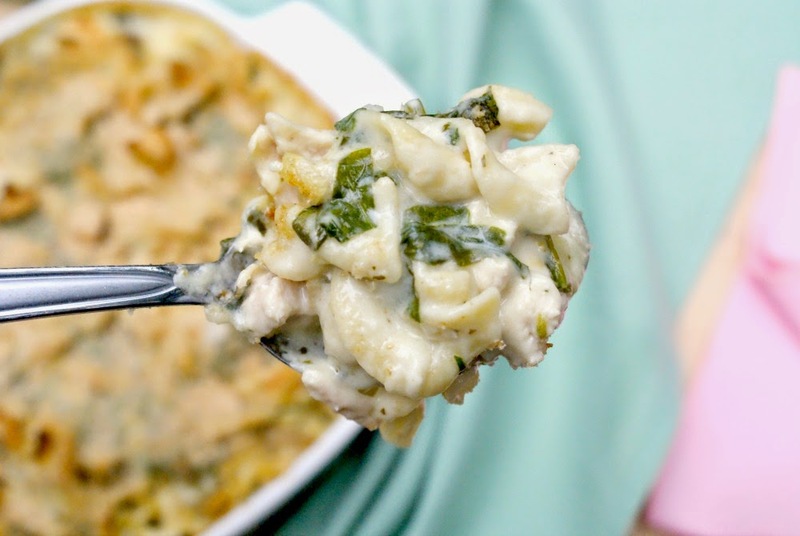 This Spinach Artichoke Chicken Casserole is delicious and rich, made with fresh spinach, flavorful marinated artichokes, chicken and a creamy cheesy sauce. I just adore casseroles. First of all, there's usually some kind of creamy yummy sauce involved. Yes, please. And cheese. Gah, I love cheese. Most casseroles are usually sporting plenty of melty cheesy goodness. Add a protien, a starch and some veggies and...voilà! A casserole is born! Considering my love of all things casserole related, I'm sure you can empathize with my disdain when my man professed to me his dislike of all things casserole. Le sigh. How was I to be with a man who wouldn't eat tuna noodle casserole, mexican casseroles, or (Lord help me) shepherd's pie. My love for him outweighed my love for the casserole, though. I occasionally slip one into the meal plan without giving him warning and listen to the boo-hoos when he finally realizes what's for dinner. He is a trooper though and suffers through it because he knows I love them. Over the years he has even come to like a few. 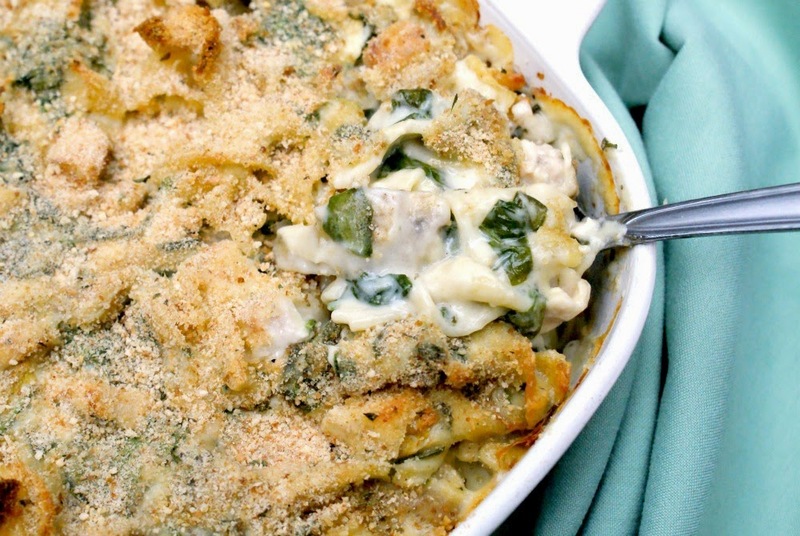 This Spinach Artichoke Chicken Casserole is one that he enjoyed and even went back for seconds. I, of course, adored it in all of it's casserole-y glory. I kinda love anything that reminds me of spinach artichoke dip, too. That's probably why I have so many spinach artichoke themed recipes on my blog like Crock Pot Spinach Artichoke Dip, Ranch Spinach Artichoke Dip, Spinach Artichoke Alfredo Pizza, and Spinach Artichoke Lasagna! A creamy, cheesy, hot and bubbly casserole reminiscent of spinach artichoke dip is a sure winner and a welcome addition to my collection! Cook egg noodles for 2 minutes less than the package directions suggest. Drain and set aside. Meanwhile, in a large heavy bottomed stock pot or deep skillet, saute onions and garlic over medium heat for 3 minutes. Add the flour and cook for 2 minutes, stirring frequently. Slowly add the milk to the pan, stirring constantly with a whisk to avoid clumps. Simmer for 5 minutes, or until sauce thickens. Remove from the heat, add the shredded cheese to the sauce and season with salt and pepper. (The sauce will be stringy and very cheesy at this point.) Stir the chicken, cooked pasta, spinach and artichokes into the sauce. Pour the mixture into a greased 9 x 9 baking dish. Sprinkle with the breadcrumbs. Bake in the preheated oven for 45 minutes. Source: Adapted from Mountain Mama Cooks.